Lima Beans/ double beans (or butter beans) are rich in folate, thiamin as well as vitamin B6. It is also a good source of fibre, iron, manganese, potassium and magnesium. This is a recipe using the same recipe that you would normally use for making chole (chickpeas in a tomato gravy) or rajma. 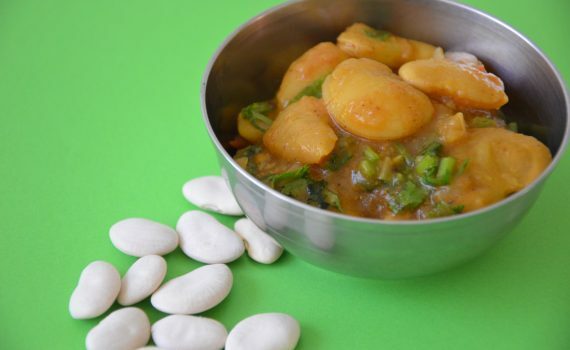 You could also add cooked double beans to different sabzi’s to add a different flavour to the sabzi while also increasing the protein content of the dish. I don’t precook the double/lima beans but cook it with the gravy. Heat the oil in a pressure cooker, when it is hot add the jeera/cumin seeds, bay leaf, turmeric powder and hing. Add the onions and fry till they start turning brown. In the meanwhile, puree the tomatoes with the ginger,garlic and green chilies. When the onions start to brown, add the puree, the garam masala, chole masala, salt and stir till the oil leaves the sides. Drain the soaked lima/ double beans and add them to the masala. Mix well, then add two cups of water. Close the lid of the pressure cooker and let it cook for one whistle. Switch off. Let the pressure drop, then open the lid, check for spices, salt. If it’s too thick you can add a little water and simmer for a few minutes.